BACKGROUND: Early access to critical care interventions may improve outcomes for severely ill and injured patients. South Africa (SA) faces the unique challenges of prolonged pre-hospital times and limited access to physicians. In 2008, the Health Professions Council of SA introduced paramedic rapid sequence induction (RSI), the gold standard critical care intervention for emergency airway management; however, the risk to benefit ratio in this context is unclear. OBJECTIVE: We conducted a pilot study to identify if paramedic RSI in the SA pre-hospital care setting is effective and safe. METHODS: We undertook a retrospective observational study of paramedic RSI performed by an emergency medical service, between 12 December 2009 and 12 December 2011. RESULTS: Eighty-six RSIs were performed during the study period. No failed intubations were reported. Heart rate was significantly reduced from a median baseline value of 112 to 90 bpm, and oxygen saturations improved from 92% to 99% at handover following RSI. Nineteen patients (22%), however, had an adverse event (AE). Female patients (odds ratio (OR) 18.3; 95% confidence interval (CI) 3.46 - 99.38; p=0.001) and patients subsequently transported by helicopter (OR 7.24; 95% CI 1.44 - 36.32; p=0.016) remained independently associated with AEs after adjusting for confounders. CONCLUSIONS: RSI performed by specially trained paramedics is effective in terms of self-reported success. However, the 1 in 5 AE rate highlights safety concerns. The importance of a robust clinical governance programme to identify problems, refine practice and improve the quality of care is underscored. Early access to critical care interventions may improve outcomes for severely ill and injured patients. In head-injured patients early intubation and controlled ventilation allow for optimal oxygenation and normocarbia, minimising secondary brain injury. The geography and infrastructure of South Africa (SA), combined with resource and financial constraints, pose unique challenges that often result in prolonged pre-hospital times. The perceived need for earlier critical care intervention led the Health Professions Council of SA to introduce guidelines for the incorporation of rapid sequence induction (RSI) into the scope of practice of qualified paramedics. The rationale, as well as training and system and clinical governance requirements, were covered in a position statement published in the SAMJ in 2011. While a Cochrane review in 2009 concluded that evidence supporting pre-hospital emergency intubation is lacking, this does not equate to lack of benefit. Pre-hospital RSI remains controversial, despite being a well-established method of inducing anaesthesia to achieve emergency intubation. The traditional technique - comprising pre-oxygenation, administration of a predetermined dose of a potent induction agent (usually thiopentone) and suxamethonium, followed by cricoid pressure - remains the gold standard. The use of cricoid pressure is now controversial and other drugs have been included in modified RSI techniques. Emergency intubation is an inherently high-risk procedure; RSI can be safely performed in well-governed doctor- paramedic pre-hospital systems, but remains highly controversial due to concerns about patient safety. While an international meta-analysis demonstrated that RSI is superior to the current paramedic practice of intubation with deep sedation alone, this has not been studied in the SA context. Recently, a randomised controlled trial in Australia demonstrated that paramedic RSI, in a well-governed system, can be performed effectively with improvement in outcomes for patients with traumatic brain injury. The risk of failed intubation and complications of the RSI procedure need to be weighed against the benefits of earlier intervention. A recent meta-analysis of intubation success rates of emergency medical service (EMS) providers concluded that non-physician operators had significantly more intubation failures, highlighting patient safety concerns. Our study attempted to establish whether RSI performed by paramedics in the SA pre-hospital context is effective and safe. We acknowledge that the decision to incorporate RSI into paramedic practice in SA is controversial, but this debate is beyond the scope and objectives of this study. We undertook a retrospective, observational pilot study of paramedic RSI performed by a private EMS over 2 years, from 12 December 2009 until 12 December 2011, from their first paramedic RSI. Two EMS staff members who were not involved in the data interpretation collected and analysed data captured in standardised patient report forms (PRFs) that documented RSI performed by paramedics. PRFs contain physiological data and free-text notes regarding each case completed by the attending paramedic. The PRF does not currently specifically request the number of intubation attempts or methods used to confirm successful intubation, which, however, may be documented in the free-text. PRFs were anonymised and specific de-identifiable data entered into Microsoft Excel (by M Gunning). Baseline vital signs of each patient: first documented systolic and diastolic blood pressure (SBP and DBP), heart rate (HR) and oxygen saturation (SpO2) were recorded and compared with final documented vital signs at handover. Patients were then assigned to one of two groups (A or B). Inclusion criteria for group A were: placement of an endotracheal tube (ETT) and absence of hypoxaemia, hypotension or other reported complications. Inclusion criteria for group B were: failed intubation and/or need to place a rescue airway device, hypoxaemia, hypotension or other complications. Group B was reviewed to ascertain the role played by the RSI procedure in patients' physiological derangement. The private EMS operates widely throughout SA and serves over 50 million inhabitants, and was the first to start the RSI programme. At the commencement of the study in December 2009, there were 12 RSI-trained paramedics (9 in Johannesburg, and 3 in Durban). By June 2012, this number had increased to 27. Paramedics had to complete a two-day university course on RSI covering theoretical knowledge and practical skills and were trained in performing RSI -including induction, paralysis and cricoid pressure - according to the standard operating procedure (SOP) following telephonic physician approval. The SOP included a range of induction agent options (thiopentone, etomidate and ketamine), but specified the use of suxamethonium for paralysis. RSI was defined as the administration of suxamethonium, which is consistent with other published studies. This contrasts with the existing practice of drug-assisted intubation (DAI) that uses only deep-sedating agents such as morphine and midazolam without neuromuscular blockade. Hypotension was defined as an SBP of <90 mmHg. When baseline SBP was even <90 mmHg, hypotension was further defined as >20% reduction in the SBP below the baseline SBP at handover. Hypoxaemia exists when the partial pressure of oxygen is <60 mmHg. For the purposes of this study, hypoxaemia was defined as an SpO2 of <90%, which generally corresponds to an oxygen partial pressure of 60 mmHg. When SpO2 was initially <90%, hypoxaemia was then defined as no improvement in, or a further reduction in, SpO2 at handover. 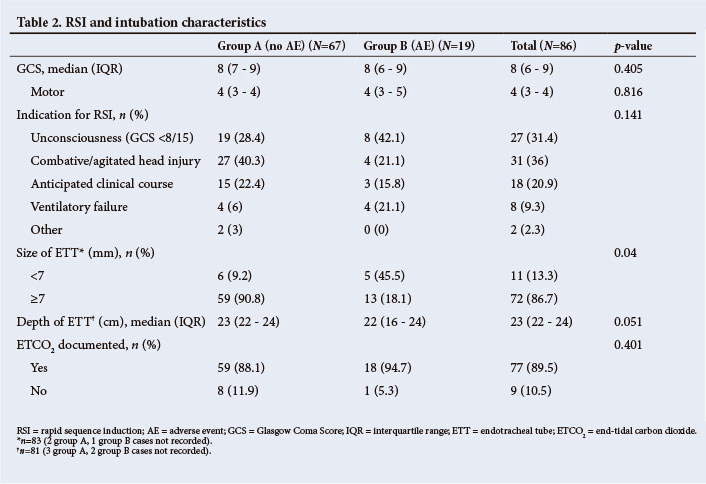 The outcomes examined were success of intubation and adverse event (AE) rate following RSI. We measured effectiveness by the number of self-reported successful endotracheal intubations (ETIs). Safety was measured by the absence of an AE (hypoxaemia or hypotension or other complication) as a result of the RSI procedure reported at handover to hospital or helicopter staff. Continuous variables are presented as mean ± standard deviation (SD) or median (interquartile range (IQR)) and categorical data as frequency (%). Categorical data were compared with chi-square test and continuous with Student's t-test. Paired samples t-test was used for the pre-post (i.e. baseline-handover) analysis. Unless otherwise indicated, analysis was based on the 86 cases. We used univariate analysis to compare baseline characteristics with development of an AE. Variables significantly associated with AE (p<0.05) were included in a multivariable logistic regression model, using a two-tailed Student's t-test and significance was assumed at p<0.05. Data were analysed using SPSS version 19.0. 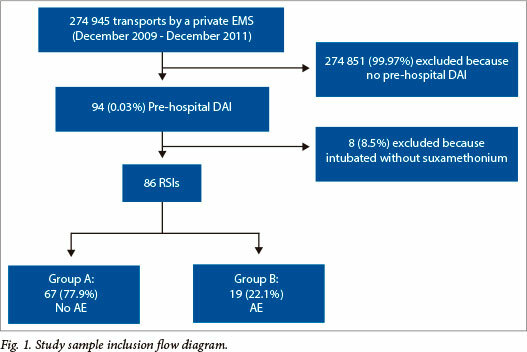 During the study period 274 945 patients were transported to hospital by the EMS, of whom 86 (0.03%) underwent RSI by paramedics and are the subjects of this study (Fig. 1). Baseline characteristics of these patients are presented in Table 1. The majority (80%) of RSIs were performed on trauma patients. The most common indication for RSI was traumatic head injury presenting as a combative/agitated state (36%) or coma (31%). No failed intubations were reported. Nineteen patients (22%) experienced an AE. Female gender, subsequent helicopter transport and age (<18 years) were significantly associated with an AE on univariate analysis. Female gender (odds ratio (OR) 18.3; 95% CI 3.48 - 99.38; p=0.001) and helicopter transport request (OR 7.24; 95% CI 1.44 - 36.32; p=0.016) remained independently associated with an AE on multivariable analysis. 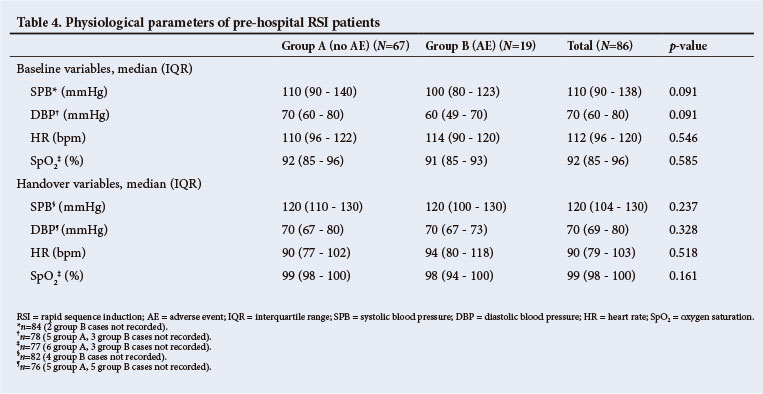 RSI characteristics are presented in Table 2. The use of end-tidal carbon dioxide (ETCO2) monitoring was documented in 90% of cases and the median Glasgow Coma Score (GCS) was 8. Anaesthetic agents administered to patients requiring RSI are presented in Table 3. 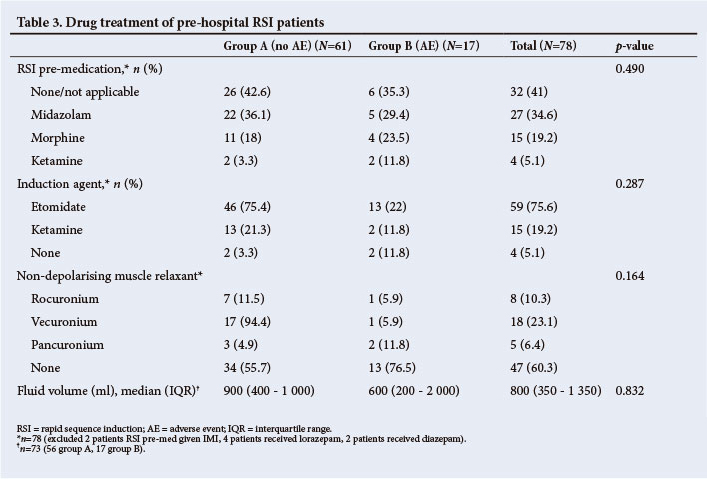 Groups did not differ significantly regarding treatments provided to RSI patients. Baseline and handover haemodynamic data are presented in Fig. 2. At baseline, most patients had a relatively normal SBP (median 110 mmHg) and DBP (median 70 mmHg), and were tachycardic (median HR 112 bpm) with a low SpO2 (median 92%). 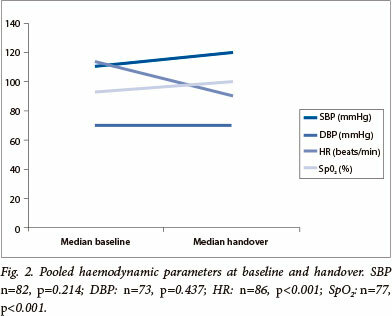 At handover, neither SBP (nor DBP) differed significantly from baseline. Median HR decreased by 22 bpm and SpO2 improved to a median of 99%. There were no statistically significant differences between baseline and handover physiological parameters between groups A and B (Table 4). Nineteen (22%) of the 86 patients suffered an AE following RSI. This manifested as haemodynamic instability in 10 (11.6%) patients, tension pneumothoraces in 3 (3.5%), intubation difficulties in 2 (2.3%), low ETCO2 in 2 (2.3%), high ETCO2 in 1 (1.2%), and an episode of bronchospasm (1.2%). Hypotension was present in 4 (4.7%) and hypoxaemia in 2 (2.3%) cases at handover. One accidental extubation was documented (detected early and the patient was successfully re-intubated). One ETT was replaced following intubation due to a suspected leaking cuff - this polytrauma patient became bradycardic following positive pressure ventilation; paramedics instituted two minutes of cardiopulmonary resuscitation, and began an adrenaline infusion before handing the patient over to helicopter staff. Bradycardia (HR <60 bpm) was noted in 3 (3.5%) patients at the time of ETI. Four (4.7%) patients were hypotensive at handover, and 6 (6.9%) were given adrenaline infusions following RSI. Eight (9.3%) patients received adrenaline infusions, 2 of whom were instituted prior to RSI. Bradycardia, potentially compromising cardiac output, was noted in 2 adults following RSI. One adult and 1 child were given atropine prior to RSI, while another adult received atropine during RSI. Hypoxaemia, vagal stimulation and suxamethonium are additional potential RSI-related causes of bradycardia. The results of our study indicate that RSI performed by specially trained paramedics is effective, at least in terms of self-reported success. Significantly, no patients undergoing RSI died. Improved oxygen saturations and reduced HR at handover suggest clinical improvement in the majority of patients following RSI. The 22% AE rate does, however, cast doubt over the safety of this intervention, emphasising the high-risk nature of the procedure and the need for an intensive EMS RSI clinical governance programme to ensure patient safety. Successful ETI after RSI is a recognised key performance indicator in EMSs performing the procedure. In this SA study, RSI was 100% effective in that no cases of failed intubation were reported. This compares favourably with the 94.8% pooled success rate of other paramedic units'51 and with in-hospital emergency department physician success rates. '61 Warner et a/.,  whose intensive paramedic RSI training programme posted a 97% success rate, demonstrated that success improved with increased practice of the technique and suggested that a minimum of 20 - 25 ETIs are needed to achieve >90% success. Notwithstanding the high success rate demonstrated in this study, a two-day training course is insufficient by comparison to the studies cited above'5,101 and is arguably inadequate to equip paramedics to safely undertake unassisted pre-hospital RSI. In SA, trainee paramedics are required to perform 3 clinical RSI scenarios successfully to meet graduation requirements. Furthermore, only approximately 3 of every 10 000 patients transported by this EMS currently undergo RSI; with current staffing levels this equates to approximately 1 RSI every 6 months. This relative paramedic inexperience may explain the high AE rate in this study. Notably, Hubble et at. '61 demonstrated a decline over time in ETI success rates and proposed that this might reflect insufficient opportunities to maintain RSI competence, all of which seems valid in the SA context. With a limited number of experienced and competent paramedics performing RSI and operating within a robust clinical governance framework, EMSs are, however, more likely to experience success. A potential under-reporting bias regarding difficulties experienced during attempted intubation exists within this study because the current PRF does not specifically require documentation of the number of attempts at laryngoscopy and intubation. In addition, the occurrence of aspiration, suboptimal ventilation, dislodged or incorrectly sited (endobronchial or oesophageal) ETTs may offset potential RSI benefits. To ensure patient safety, pre-hospital anaesthesia should be practised according to in-hospital standards. '51 Accordingly, ETCO2 monitoring is now considered essential'101 and forms an integral part of the RSI SOP. The current PRF however does not specifically require ETCO2 to be recorded. In 10% of patients there was no objective record of successful ETT placement, highlighting the need to urgently redesign the PRF. In this context, it has been suggested that hypocarbia may negatively impact on pre-hospital RSI. Waveform capnography monitoring has been recommended to confirm successful ETI or detect dislodged ETTs, and also limit the risk of hyperventilation. While most pre-hospital studies publish RSI success rates and warn of the possible complications, the incidence of AEs in this setting is not known. The overall AE rate in this study was 22%, which is arguably too high to be considered safe. Stringent criteria were employed to define what constitutes an AE to increase the sensitivity of this study to detect problems, given the potential for under-reporting. Because patient safety is paramount, this is an area that EMSs should focus on, along with a robust clinical governance programme. Strategies should include ongoing training (including supervised in-hospital RSI experience) and regular case review to identify and target improvements that could reduce the AE rate and improve patient outcomes. The importance of accurate and thorough documentation deserves re-emphasising as only two complications relating to intubation were documented in the free text section of the PRF. More of such events might have been expected, but underreporting was most likely the result of the free text system in the current PRF. Hypoxaemia and hypotension were chosen as markers of AEs since SpO2 and BP are objective physiological parameters, which are routinely monitored by attending paramedics. While BP was essentially unchanged, HR was reduced and SpO2 improved in the majority of cases. These latter markers of improved perfusion and oxygenation indicate clinical improvement. Hypoxaemia and hypotension in the context of traumatic head injury, which proved the most common indication for RSI in this study, are known to increase mortality by as much as 75%. '131 Hypotension commonly results from hypovolaemia and obstructive shock in trauma patients while positive pressure ventilation and excessive amounts of intravenous induction agents'51 have also been implicated. Hypoxaemia following paramedic RSI has been associated with an increase in patient mortality. '81 There were 2 cases of hypoxaemia at handover; 1 possibly as a result of hypovolaemia and 1 suspected pneumothorax. Three patients were suspected of developing tension pneumothoraces following positive pressure ventilation, treated by needle thoracocentesis. This is concerning, as untreated tension pneumothoraces are universally fatal and definitively draining the pleural cavity currently falls outside of the paramedics' scope of practice. Remarkably, female gender was an independent predictor of an AE (OR 18.3; 95% CI 3.46 - 99.38; p=0.001). There were, however, no significant differences between the baseline vital signs and GCS between males and females. There were more medical indications for RSI in females (40% v. 10% in males), but this was not associated with an increase in AEs. A recent meta-analysis'61 showed substantially higher success rates in medical patients. It is widely accepted that factors associated with pregnancy, including, but not limited to, enlarged breasts and full stomach, can increase the incidence of difficult and failed ETI and AE. '91 The median age of women in this study was 33 years and there were no documented pregnancies, thus the authors can only speculate as to the reason for the increased AE rate. Trauma is generally more common in male patients, but the small sample size in this study (although similar to other pre-hospital RSI research) limits our ability to draw further conclusions regarding this high AE rate in female patients. 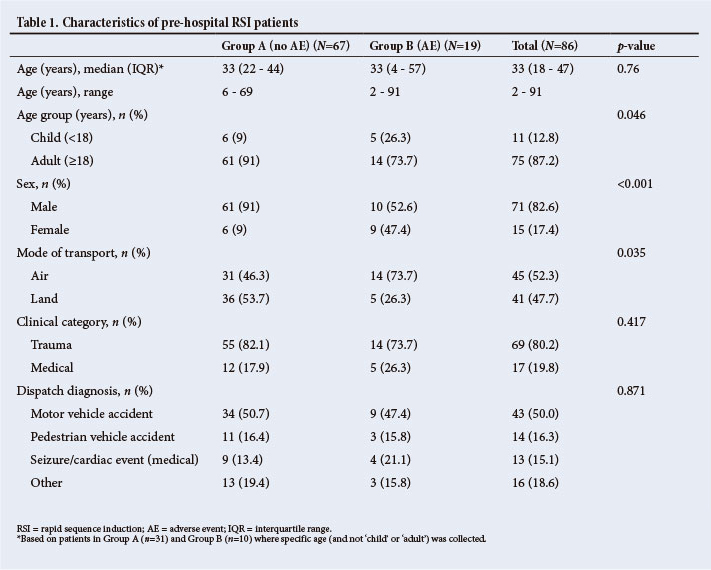 Transport to hospital by helicopter was significantly associated with an AE (OR 7.24; 95% CI 1.44 - 36.32; p=0.016). Anatomically more severe injuries typically prompt paramedics to request helicopter transport. The Injury Severity Score (ISS) is an anatomical score, but it was not possible to calculate the ISS from the limited information available on current PRFs. There were, however, no significant differences between the baseline vital signs, GCS and mechanism of injury of patients transported by land and air; suggesting that the patients' condition was similar in both groups prior to RSI. It is important to note that vital signs were recorded at the time of handover to the helicopter staff before transport. If indeed there were no baseline differences between patient groups, the assumption is that either paramedics called for helicopter assistance following RSI complications or that increased AEs were a result of delayed helicopter arrival. This emphasises the importance of keeping EMS scene times to a minimum and of prompt helicopter dispatch. It bears noting that helicopter transport, compared with ground transport, has been associated with improved chance of survival to discharge in seriously injured adults. Pooled paramedic success rates of 83% have been reported for paediatric ETI. There were no failed paediatric intubations in our small sample of 11 patients. There was a single case of increased ETCO2 in a young child, suggesting hypoventilation, as a result of increased dead space. Pre-hospital paediatric RSI is challenging and increased AEs are expected in this high-risk group. This is the first study of the safety and efficacy of the newly implemented paramedic-led RSI programme in SA. It has established a 22% baseline AE rate and identified at-risk groups for focused ongoing training and targeted improvements. There are several notable limitations to this study including the retrospective study design and small sample size, based on PRFs subjectively completed by paramedics. Regarding the statistical analysis, using 3 variables in the multivariable regression analysis amounts to >10 events per variable. '151 We were of the opinion, however, that it would be difficult to select only 2 variables without introducing bias into the analysis. One of the most important factors in ETI success is the level of previous experience of the operator, and this was not known. The PRF does not specifically request the number of intubation attempts or methods used to confirm successful ETT placement. There was no objective physiological monitoring data (thus possibly underreporting AEs), injury, complication, or hospital outcome data. We did not have access to response times to assess the impact of delays on scene awaiting helicopter transfer. RSI performed by specially trained paramedics is effective in terms of self-reported success. Importantly, no patients undergoing RSI died. Improved SpO2, and reduced HR at handover suggest clinical improvement in the majority of patients following RSI. However, the 20% AE rate highlights significant patient safety concerns, and the importance of a robust clinical governance programme to identify problems, refine practice and improve the quality of care. We recommend that the EMS implement a modified PRF to improve documentation to identify the true AE rate - with objective physiological data capture and printouts, including capnography -and a system of patient follow-up that captures patient outcomes. Better reporting would support performance improvement, increase the quality of future research and assist in determining the exact role of paramedic RSI in the SA context. Acknowledgements. We thank A Laubscher and N Nevin for their assistance with collecting, printing and anonymising the patient report forms.